We are starting a new series in the test kitchen called Toast Tuesdays! Every Tuesday we'll post a new toast recipe, and we aren't just talking about toast with butter and jam, although that's good too, we are going to elevate toast and highlight as many different combinations as possible to brighten your mornings or get you excited to snack! 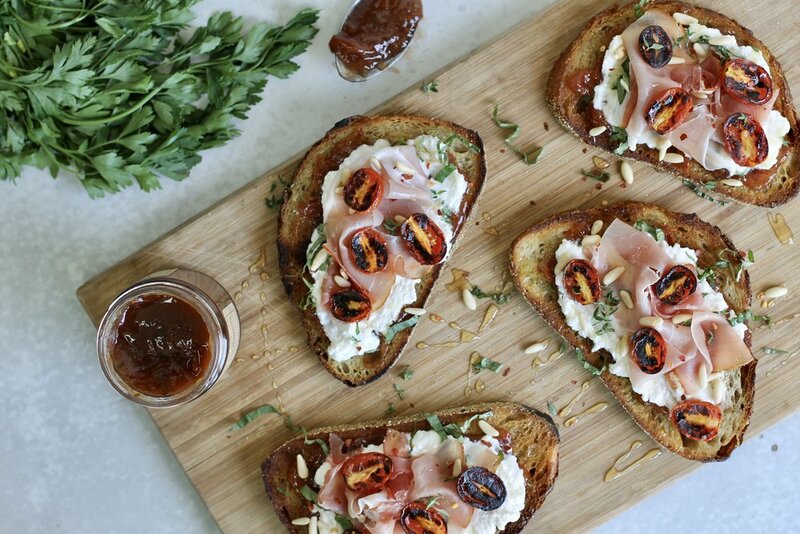 First up is this drool worthy recipe for Smoked Tomato Toast with Ricotta + Prosciutto, with a few other delicious add ons! Chop cherry tomatoes in half and when the skillet is fully heated place them cut side down onto the skillet until they are fully blistered. Set aside. After the bread is fried smear the Smoked Paprika Tomato + Basil Jam all over it. Next smear the ricotta cheese on top of the jam and sprinkle with sea salt and basil. Add a slice of prosciutto to the top of the ricotta, then add the blistered tomatoes, pine nuts and the leaves from 1 sprig of thyme. Finally drizzle with honey and chili flakes.